The Eaton 9130 Rackmount UPS delivers online power quality and scalable battery runtimes for rack servers, voice and data networks, storage systems and other IT equipment. 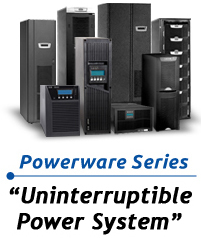 With an efficiency rating of >95%, the 9130 UPS cuts energy costs while packing up to three kVA of power into only 2U of rack space. The 9130 UPS significantly extends battery service life with ABM technology.